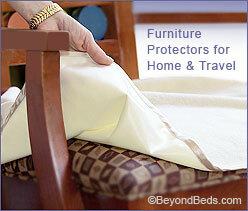 Protect-A-Bed® protectors are the gold standard in protection! This quality product is made of 100% soft cotton terry, backed with a breathable polyurethane film. 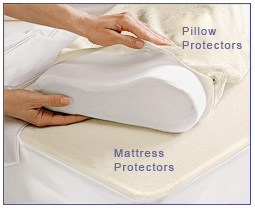 Both the mattress and pillow protectors repel liquids and stains while allowing body vapor to breathe. The revolutionary barrier fabric also prevents bacteria and dust mites from breeding (a major cause of asthma, eczema and rhinitis). Remember, it takes only one accident to spoil a good mattress or pillow. The AllerZip Mattress encasement protects your mattress and foundation from bed bugs, dust-mites, dirt and liquids. Designed with the unique ALLER-ZIP™ seal and three-sided BugLock™ zipper system, this high-quality,mattress encasement is constructed of soft and breathable polyester fabric atop a layer of space-age BreathCool Miracle Membrane®. Extend the life of your pillows with an added layer of protection. These 16 Momme Silk Charmeuse Pillow Protectors are not only luxurious they are hypoallergenic and dust mite resistant, in fact, silk is the most hypoallergenic of all fabrics. Silk is highly absorbent and can absorb up to 30% of its weight in moisture without drawing moisture from the skin. The ultimate in protection! These Protect-A-Bed® protectors are made of soft plush cotton, backed with an exclusive waterproof Miracle Membrane® that is air vapor porous, allowing your body heat to easily pass through.The revolutionary barrier also prevents bacteria. Available in a kit or two throws with your choice of plush or terry. Use in your home, office, or for traveling. Works great for car and sofa protection for people and pets.